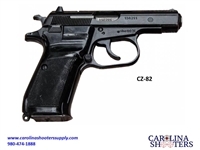 Purchase your Surplus CZ-82 9x18 Pistol online at Carolina Shooters Supply. Historic Czech Military/Police Pistol. Imported by Century Arms, this is a must have C & R Eligible pistol. Make this CZ-82 your next gun purchase. Own this Classic Firearm today.